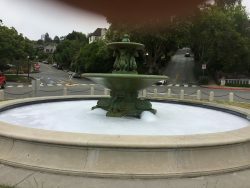 Another soaping: After a long lull, the fountain has now been soaped for a second time in just over a month. It happened the evening/early morning of Feb. 9-10. As always, it is discouraging that someone(s) not only chooses to do potential harm to the fountain works, but also causes the wasting of thousands of gallons of water and requires the investment of several hours of volunteer (and sometimes city staff) effort to fix the problem. It really needs to stop. It’s not harmless fun; it’s vandalism, with real consequences. We expect things to be up and running again very soon. Electrical issues: You may have noticed that the fountain is not a lit up at night as much as usual. That’s because we have experienced a few electrical problems. One issue is that there is a short-circuit somewhere that is shutting off the lights in the large pool that illuminate to upper bowls of the fountain. We are working with the city to fix this and hope to have it resolved soon. City electricians are also looking at replacing some aging timers that help control the fountain pumps and lights. New landscaping: The new (as of November 2017) plantings on the fountain island and around the perimeter of The Circle are generally faring well. We’ll evaluate how things look as we get into spring. 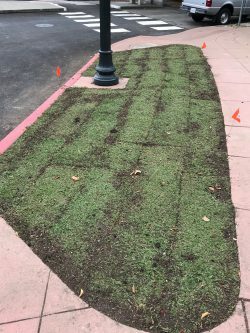 The new landscaping is a definite improvement on the old sod it replaced. We hope it will thrive; your cooperation by keeping yourself (and your pets) off will certainly help. Hail and farewell: Our organization has said farewell to one board member and welcomed another aboard. Scott Dunlap has been involved with FOFW for the past six years, first as a volunteer, then as a board member. 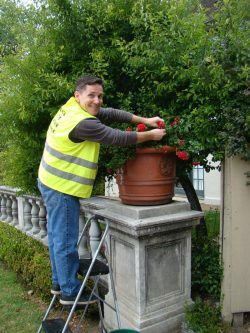 Besides being an active and thoughtful board member, Scott has headed our volunteer maintenance crew that helps keep the fountain running; has cared for the geraniums in the large pots on the balustrade that borders The Circle; and was the impetus for the garlands of lighted greenery that adorn the fountain island each holiday season. While he is stepping away from the board, he plans to remain involved as a Friend and volunteer. We thank him and wish him the best. Our new board member is Circle neighbor and longtime FOFW volunteer Karen Borst-Rothe. Karen, a writing instructor at UC Berkeley and UCSF and a writing consultant to Bay Area businesses, joined the board in January. For many years, she has helped keep the area around The Circle clean and weeded, during our first Saturday work parties and on her own. She wanted to boost her involvement with FOFW this year, and we are glad to have her as a new director. A big thank-you: Last, but not least, thank you to everyone who donated to FOFW over the holiday season and into the new year. Your generosity helps us be ready to take on urgent repairs, purchase needed items and plan improvement projects around The Circle and Fountain Walk that the city can’t get to or that need extra funding. So thanks again.